The Princessa de Penasco is one of the most quaint and beautiful resorts on Sandy Beach. 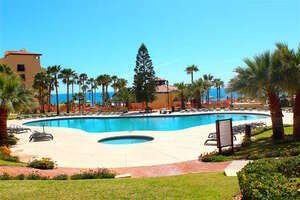 This resort has a beautiful beach front swimming pool, kid’s pool, Jacuzzi and a state of the art fitness center. The resort also has another pool in the back of the complex. You can lay under the palapas on the resort lounge chairs or sunbathe by the pool. There is a restaurant and bar named Colin's Cantina, and an on-site convenience store in the check- in office. You will not be disappointed with the accommodations of this family friendly resort. This 2 bedroom and 2 bathroom condo is located ocean front on the ground level of the A Tower. This condo can sleep 6 people; 2 in each bedroom and 2 on the queen size sleeper sofa in the family room. The family room of this condo has a lovely sofa, love seat, coffee table, end tables and a media cabinet. The media cabinet has a TV, VCR and CD player. The condo comes equipped with high speed wireless internet. You can get to the patio through the sliding glass doors off the family room. The dining room has a round glass top table set to seat four. The room also has a giant dark wood china cabinet and a beautiful chandelier that lights the area. The kitchen has white wood cabinets with freshly renovated granite counter tops and black on black appliances. The kitchen also has available seating at the built in bar lined with three bar stools. The kitchen has all the tools you need to cook a wonderful meal. The only things you need to bring are the food and beverages. The master bedroom has a Queen size black wrought iron bed with orange, white and gold checkered bedding. The room comes with two lighted bed side tables and a dresser. The master bedroom has a giant window that looks out to the ocean. There are two small closets; one on each side of the window. There is also a cabinet below the window where you could store your luggage. The master bathroom has an arched entry with a single sink vanity and a private tub, shower and commode. The 2nd bedroom has accommodations for two guests. The room has a matching suite of furniture that includes a bed, night stands, and a dresser. The room has a closet where you can hang clothing and a window that looks out to the entry of the condo. The 2nd bathroom can be accessed through the hallway. The 2nd bathroom has a single sink vanity with a commode and walk in shower. The patio provides a beautiful view of the entire splendor that the Princessa has to offer. You could have cocktails and dinner on the patio, and then take a walk down to the beach and watch the tide roll in and out. The condo also comes with a washer, dryer and ceiling fans throughout. You will be very happy with your decision to stay in this condo.